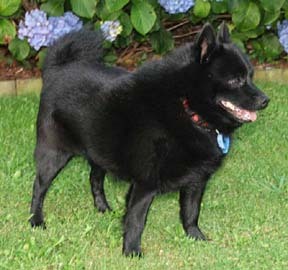 What is a Schipperke (Skipper key)? Well, it is a dog. A Belgian dog. A small black dog with a fox face, J-Lo booty and the entitled attitude of Tara Reid on a bender after mowing down sixteen pedestrians in her SUV. They are hyper, yappy and I haven’t met one yet that couldn’t double as a boat float. Why all the yappy dog, Schipperke hate this morning? I live in a condo and there is a furry hell ball next door. I know, I don’t have to live with him. I don’t have to deal with the yapping and the biting and the attacking of the front door but there is something I do have to deal with. The pee. Yeah, it seems he can’t even wait to get downstairs to do his business and will pee in the elevator. There I was, minding my own business when I step into … a puddle of pee. How do I know it was the demon dog that did it? I had just come up on the elevator as I had forgotten something in my condo. The elevator was clean. The rat dog and his handler went down. I waited until after they left because I really didn’t want to be in a confined space with a whirling dervish of teeth and fur. When the elevator came back up, I stepped in and … yeah. CSI tests not withstanding, I am pretty sure the dog peed in the elevator. I know, you Schipperke fans out there are saying “It’s just one dog. They aren’t all like that!” Perhaps but I do know someone else who has one of these big bottom dogs and if anything it is more annoying than the pee monster next door. This one bites, yaps and even ate Boba Fett. Yes, this demon dog from Hell ate the Star Wars bounty hunter. That should tell you something! Fine! Mr. Fett was an action figure but still! That dog is mean. I know puppies are all cuddle and cute and I adore dogs but some are just annoying a-holes. Just like people. So todays question is “What are your demon dog stories?” Is there a yippy dog in your life you’d like to use as a boat float? Inquiring minds want to know. Posted on August 2, 2010, in Uncategorized and tagged condo, schipperke, yappy dog. Bookmark the permalink. 5 Comments. Oh good lord! Don’t get me started on dog horror stories. I’m a dog owner and lover and make a real effort to make sure my guys don’t annoy the neighbors, don’t bite or pee on guests, and are generally sweet and polite to the world. I’m always stunned by the people who walk their dogs, leash free, and then when it lunges at you and your dogs… smiles and says “don’t worry, it won’t hurt them.” Really? You’re sure? You can’t even control it while it’s walking down the street, I’ve seen it lunge at you, and you are it’s supposed “master.” No. I don’t trust you. Put your dog on a leash, or don’t walk down my street any more! My friend and I went shopping in Little India and were walking from my car to the shops when a mini poodle came flying out of it’s house barking. It climbed over the 4′ fence, landed on the sidewalk and began snarling & barking at us. I pushed my friend behind me and went into Animal Control mode. Usually stomping and yelling frightens these small dogs off. Imagine MY surprise when the dog launched himself at me! I backed up and all he did was make a hole in my jeans (my BRAND NEW-wearing-them-for-the-first-time jeans!!) The dog owner never came out of his house, I charged the dog but it ran off. The neighbors came out of their houses. My friend whipped out her phone & took pix. The security man across the street came over to see if we were OK and told me this happens all the time. The neighbor told me to let it go because the dog owner was disabled. I told them both the dog owner was in violation of the law, that the law applies to disabled people too. He needs to either keep the dog inside, come outside with the dog or build a taller fence that the dog can’t get over. I called and called the dog owner out, but he never came out. I know he was home because the door was open & I could see the TV on. So I went over to his mailbox and got his name & address off his mail. I sent the pix & info to Animal Control. I also did the follow up phone calls. ya gotta keep the fire burning under their tails. Too bad it was County jurisdiction, so I didn’t have any pull. I’m an animal lover. All kinds, shapes & sizes. I owned a pug in high school, and he was a love bug. Hell, he was a pug! He couldn’t get his mouth open wide enough to bite anything! But he was the last small dog in my life. Ever since I got all growed up, I’ve owned large/giant dogs. My 12 year old Rottweiler passed away last November. She was a big warm floor ornament. If she EVER barked, you’d better listen, because she didn’t bark at people walking their dogs past her. I went into being a large dog owner with my eyes open to the responsibility. So why can’t small dog owners do the same thing? I have THREE of those LBDs ( Little Black Devils). They are extremely headstrong, but just as protective and loyal. With proper training, discipline, and owner handling, they can be well behaved. They will always be strongly protective of their owner, and hyper, but like a child, they need attention and a firm hand. MY gripe is those pit bull mixes that people think are so great, then they are turned loose or dumped when they prove to be too much to handle. I hear ya Carole. In the end, I feel a great portion of a dogs behavior is his home life and what kind of owner he has. In fact I would say the little tornado’s owner is actually worse than the dog.